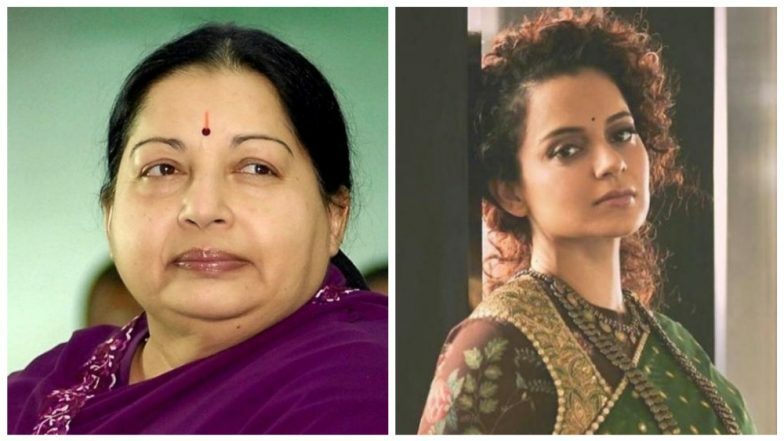 Kangana Ranaut To Play Jayalalithaa in AL Vijay's Biopic on the Politician Titled as 'Thalaivi'? Kangana Ranaut has once become a rage, thanks to the success of her last film Manikarnika: The Queen of Jhansi. Despite surrounded by controversy, the flick managed to hit the bull's eye. Since then, the fans have been waiting for the next big venture. As per the latest reports, she will be next seen in the biopic of late Tamil actress and politician, Jayalalithaa. Directed by AL Vijay, this film will be reportedly titled as Thalaivi. Kangana Ranaut Birthday Special: 5 Times the Feisty Actress Broke Rules In Bollywood Like A Queen!. The film is said to be one of the most ambitious ones. The popular figure has a massive fan-base and chronicle on her life was in demand for many years. There were many speculations surrounding the project as to who would fit into this iconic political figure. But as luck had it, it is the three-time-national award winner who will be seen donning the character. Earlier, in an interview with Simi Garewal, Jayalalitha was asked about her thoughts on the biopic if it was ever made. On that, she had expressed that she would love to watch Aishwarya Rai Bachchan play the younger version of herself. However, now that the Queen star is roped in for this iconic character, we're sure her loyal fans will be simply over the moon! Also, another interesting part of this project is that, this flick is supervised by known writer Vijayendra Prasad. He wrote scripts of blockbusters like Baahubali, Manikarnika amongst others previously. There is no official confirmation on the same yet from her side. What do you think about this big collab?